Circle time ideas, workshop suggestions, outdoor activities, and lots of learning fun for the best apple-picking season yet! 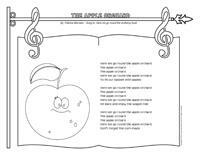 Stickers, a picture game, word flashcards, activity sheets, games, and many other apple-themed documents that are ripe for the picking! 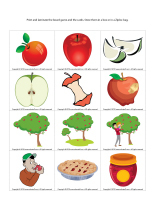 (Open thematic poster-Apples) Print, laminate, and decorate the walls of your daycare with all kinds of posters. (Open garland-Apples) Print. Let children decorate the garland. Cut it out and hang it within your daycare or near your daycare entrance. 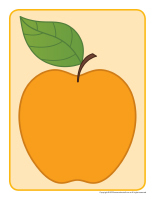 (Open educa-theme-Apples) Print and laminate the items that represent the theme. Use them to present your theme to your group (and parents) while decorating a corner of your daycare. 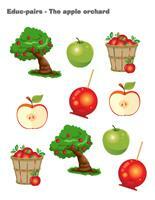 (Open stickers-Apples) Print on adhesive paper and use the stickers for various projects throughout the theme. This activity can be completed over a period of several days. 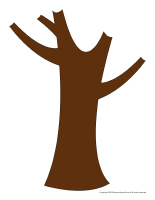 Trace and cut a tree trunk out of brown construction paper (or brown paper grocery bags). Glue the tree trunk on a wall using adhesive putty. Use a pencil to trace a large circle on brown paper. Cut it out and glue it on top of the tree trunk. Cut squares of green tissue paper and have children crumple them. When they are done, have them glue them on the tree. (Open kind word-Apples) (Open kind word-Apples-Color) Print the apples and have children cut them out and color them using red, green, and yellow crayons. At the end of the day, invite children to bring a few apples home with them so they can ask their parents to write kind words or messages on them. The next day, have children add the apples to your apple tree. This tool was created in response to a special request received. (Open group identification-Pink flamingoes) Print and laminate the posters and illustrations to identify children’s places and belongings. 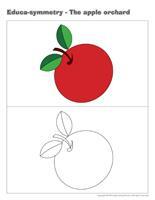 (Open picture game-Apples) Print and laminate the pictures in the format you prefer. Use them to spark a conversation with your group and ask them questions about your theme. (Open Poni discovers and presents-Apples) Print the various cards. Laminate them and cut them. 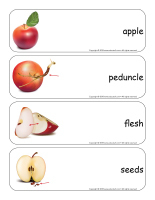 Use a Poni puppet (or another puppet that children are familiar with) to present the different types of apples to the children in your group. The pictures may be used as a memory game or to spark a conversation with the group. Use them to decorate the daycare or a specific thematic corner. 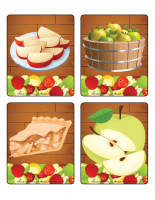 (Open picture game-Apples) Print, laminate, and store in a “Ziploc” bag or in your thematic bins. 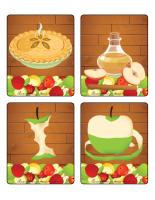 (Open picture game-Apples) Print the pictures twice and use them for a traditional memory game. 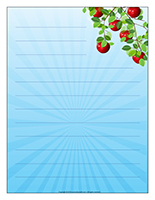 (Open stationery-Apples) Print. The stationery can be used to communicate with parents, in your writing area, or to identify your thematic bins. 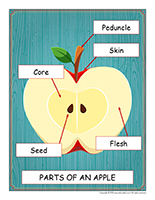 (Open educa-nuudles-Apples) Print for each child. Have children color the sheet and use Magic Nuudles to give it a three-dimensional look. Variation: You don’t have Magic Nuudles? Have children fill the spaces designed for Magic Nuudles with bingo markers or stickers. To order Magic Nuudles. Fruits and vegetables children can wash in a large tub of water. 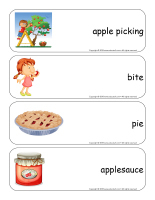 (Open word flashcards-Apples) (Open giant word flashcards-Apples) Print and laminate the word flashcards. Have each child pick a word and present it to the group (ex. pie). Ask them questions to see what they know about the theme. 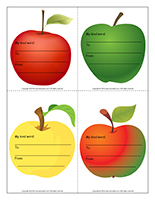 (Open word flashcards-Apples) (Open giant word flashcards-Apples) Print two copies of several word flashcards. Hang one copy of each word on an indoor clothesline with colourful clothespins. Arrange the copies in a pile on a table. Let children take turns picking a word and finding the matching word on the clothesline. When they find a match, they can place the flashcard on top of the one that was already hanging on the clothesline. Help younger children manipulate the clothespins if necessary. 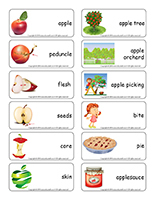 (Open word flashcards-Apples) (Open giant word flashcards-Apples) Print several word flashcards and hide them throughout your daycare or yard. Divide your group into two teams. When you give them the signal, children must search for the flashcards for a pre-determined period, for example three minutes. When the time is up, children must be able to “read” their flashcards to earn a point for their team. If they are unable to find the correct word, the other team can earn the point if they succeed. 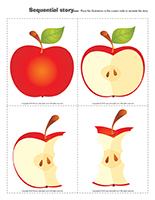 (Open sequential story-Apples) Print the story, laminate the illustrations and cut them out. Children must place them in the correct order. (Open felt board games-Apples) Print the shapes, stick them on pieces of felt, and cut them out. Stick four pieces of black felt on a large piece of cardboard to create a felt board. Display it on a wall at children’s level. The felt shapes will stick to your felt board. Children will love using them to create various scenes and stories. 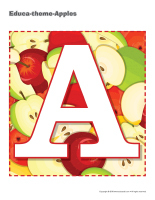 (Open poster-Apple alphabet) Print and display in a specific location or in your circle time area to decorate your daycare and introduce children to letters. With your group, decorate a cardboard box to make it look like a tractor. You could, for example, paint it with green or red poster paint and stick large cardboard wheels on either side. Glue two pieces of rope on either side of the box so the driver can set them on his shoulders. You could have a straw hat for the driver to wear. Children will enjoy taking turns driving the tractor. The other children can simply walk behind the driver, holding your walking rope that will represent a wagon being pulled through the apple orchard by the tractor. If there is an apple tree in your neighborhood, you may even be able to pick a few apples with your group! Here is a great way to practice counting skills while giving children the chance to be active. Roll an oversized red die to determine how may steps children are to take. Count your steps with the children in your group. Roll the die again and so on. (Open game-This is my spot-Apples) Print two copies. Laminate and cut out the cards. Glue one copy of each card on the table using adhesive paper. Drop the other copies in a bag. Children take turns picking a card to determine their spot at the table for the day. You may also use the cards to determine naptime spots or for your task train. Inflate an equal number of red and green balloons. Use colorful electrical tape to divide your playing area into two equal parts. Divide your group into two teams: the green apples and the red apples. Deposit all the green balloons on one side of the playing area and the red balloons on the other side. Play a song. The object of the game is to toss all the balloons belonging to the other team on their side of the playing area before the music stops. If there are more green balloons on the side of the red team than there are red balloons on the side of the green team, the green team wins or vice versa. Children love climbing ladders whenever they visit an apple orchard. Set up a small ladder or stepladder in your daycare. Set a bowl filled with apple slices at the top of your ladder. With close supervision, children take turns climbing the ladder to “pick an apple”. Keep going until your bowl is empty. Be sure to put your ladder or stepladder away as soon as the activity is over. (Open miniature apples) Print and laminate. Hide the apples throughout the daycare and invite children to hunt for them. The child who finds the most apples can hide them for the next round. (Open apple family) Print, color, and laminate the models. Glue them on magnetic paper and cut them out. Set the apples on a table along with a cookie sheet. Children will have fun sticking the apples all over the surface. (Open apple game) Print, laminate, and display on a wall. Just like in “Pin the tail on the donkey”, blindfold children and let them take turns trying to stick the apple seeds as close to the right spot as possible. Gather several apple pictures and illustrations and stick them throughout your daycare so that you have apples on walls, cupboards, and the floor. As children move about during the day, they will enjoy discovering the apples. Pick a child who will be the “apple”. He must chase the other children until he touches one. The child he touches becomes the apple for the next round. Variation: The child who is touched by the apple must remain perfectly still, with his arms stretched out. Another child can save him by running under his arms. Many children may have their arms stretched out at the same time. Make sure you change apples often, children will get tired fast. Provide a large quantity of red building blocks. With your group, stack the blocks to represent an apple. Keep going until your “apple” falls to the floor. Fill a kiddie pool with crumpled pieces of different types of fabric. Hide miniature apples in the bottom of the pool. When you give the signal, invite children to search for the apples. Every time they find one, have them deposit it in a basket before going back to search for more. Once all the apples have been found, start over. Divide your group into two teams. Draw a starting line and a finish line. Set a cone on the finish line. When you give the signal, the first child from each team must pick up an apple, walk to the finish line, go around the cone, and come back to the starting line to hand the apple to the next child in line for his team. The first team that finishes wins. Fill two buckets with water and set them on a line. Draw a finish line and set two empty buckets on it. Divide your group into two teams. Using a plastic apple (or a red bowl to represent an apple), children carry water from one end to the other. The goal is to fill their team’s bucket (the one on the finish line) as quickly as possible. This race is a modified wagon race. Each child finds a partner. One child gets down on his hands and his partner raises his ankles. Set a small apple on each “wagon”. The apples mustn’t fall off, from the start to the finish line. Ask children to stand in a circle. Hand one child an apple. Children must pass the apple to the child on their right without ever using their hands. If a child drops the apple, he will have to sit in the middle of the circle. Once all the children are sitting, start over. 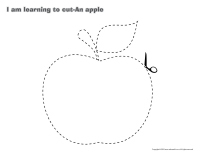 (Open I am learning to cut-An apple) Print for each child. Children must trace the dotted lines and cut out the shape. 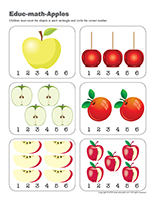 (Open I am learning to count-Apples) Print, laminate, and display at children’s level. 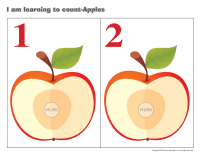 Using Velcro, children must stick the correct number of apple seeds on each apple. Children stand in a circle. One child walks around the outside of the circle saying “apple” behind each of his friends. When he says “apple tree”, the child he is standing behind must run after him and try to catch him before he sits in his spot. You will need a few swimming pool noodles. Try to find red, yellow, and green noodles to represent apple colors. Using a knife, slice the noodles. If it is hot outside, fill a kiddie pool with water and set your foam “apples” in it. Invite children to use their hands to remove the “apples”. For a greater challenge, have children try to catch the apples with chopsticks. They can either insert one chopstick in the hole in the centre of the apples or use two chopsticks like tweezers to catch them. Once all the apples are out of the water, have children sort them by color. For this activity, you will need a large cardboard box. Open the box completely so that you have a flat surface. Next, cut the cardboard to represent an apple tree outline. Set you cardboard apple tree on the grass in your yard. You can have children paint the leaves using green poster paint. Once the paint is dry, your cardboard apple tree will become a target that children must try to reach by tossing red, green, and yellow frisbees. Once all your frisbees have been tossed, count the frisbees that landed on your apple tree. Repeat, trying to beat your record. (Open models-Apples) Print and hide the apples throughout your daycare. Hide one apple per child. When children find an apple, they must set it on a table. Once all the apples have been found, let children play with them or hide them and start over again. You will need one very small, very round apple. Have children sit in a circle. The child holding the apple says, “Roll, apple roll, all the way to…” The child completes the sentence by naming the child he is rolling the apple to. You may also use a red ball for this activity. 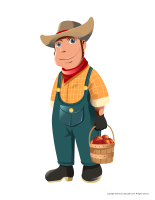 (Open dress-up dolls-The apple grower) Print and laminate. Set the doll and clothing items on a table. 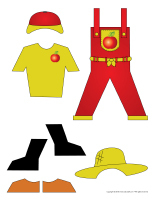 Children will have fun dressing the apple grower. 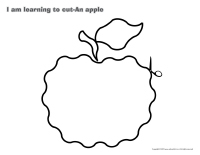 Before presenting this activity, cut apple shapes out of heavy cardboard. Draw a face on each apple (happy, sad, scared, surprised, etc.) and use adhesive paper to solidify them. Spread the apples out on the floor, upside down. Children turn over one apple at a time and mime the corresponding emotion. Display a large piece of paper on a wall, near your daycare entrance. Ask parents to help you make a list of objects that are round like an apple. Plan a field trip to a local apple orchard. Invite parents to join you. Ask parents to accompany you for a trip to the supermarket. Show children different types of apples. 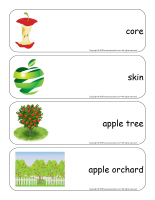 (Open word-filled apple tree) (Open word flashcards-Apples) Print several copies and laminate them for durable, eco-friendly use. You will need an apple-shaped stamper or a washable red marker. Encourage children to stamp or color the letters that make up their name or the letters that make up the words appearing on the word flashcards. Next, let them try to write the words on the lines. 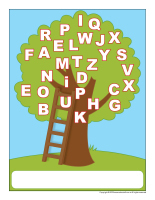 (Open apple orchard ladder) Print for each child. Children add the ladder bars in numerical order. They can color the scene and add details such as baskets if they wish. 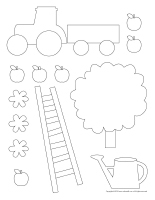 Use brown or green electrical tape to draw a large apple tree on a wall within your daycare. Use red and green tape to add small X’s near the top of your tree. Inflate red and green balloons to represent apples. Show children how they can rub the apples on their clothing to create static electricity and then press the “apples” on an X of the corresponding color. 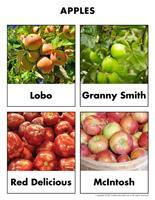 You may also choose to create two apple trees and fill one with red apples and one with green apples. The apples won’t stay in place for long, making this a source of perpetual fun. Empty the contents of two bags of apples in a basket. Gather items that measure less than one metre: a book, a piece of ribbon, a sweater, a pillow, a blanket, a stuffed animal, a picture frame, a water bottle, etc. To begin, invite children to lie down on the floor and measure them by setting apples next to them, from their feet to their head. Count the apples. Children will think it’s very funny to know they are as tall as “X” apples. Let children measure the items the same way. You will need a few apples of each color: red, green and yellow. Use the apples to create a simple pattern. 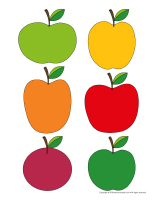 For example, you could line up a red apple, a green apple, a red apple… Children will have to continue the pattern. They will also enjoy creating their own patterns. If you wish, provide other types of fruit that can be used to make more complex patterns. (Open color by number-Apples) Print for each child. Children must color the picture per the color code. 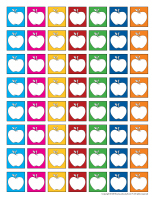 (Open educ-math-Apples) Print and laminate for durable, eco-friendly use. Children must count the objects in each rectangle and circle the corresponding number. 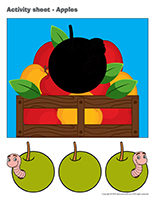 (Open Games-I’m counting worms) Print, laminate, and glue an action under each apple. Children take turns picking an apple. Have them count the worms on the apple. If they succeed, read the action that can be found under the apple and have them perform it. 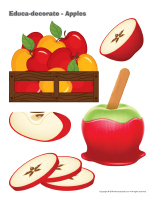 (Open colorful apples) Print, laminate, and stick apples on the floor, within your daycare. To the sound of music, children walk around the daycare. When the music stops, they must quickly find an apple to stand on. You will need brown pipe cleaners and red necklace beads that can easily be threaded onto the pipe cleaners. Invite children to slide a certain number of beads onto each pipe cleaner, leaving a few centimeters between them. The beads will represent apples while the pipe cleaners will be branches. The lower third of each pipe cleaner mustn’t have beads. Once the beads are on the pipe cleaners, hold five or six pipe cleaners in your hand. Twist the portion that doesn’t have beads in your hands to create a tree trunk. Older children will be able to do this step. Glue the miniature apple trees on a piece of cardboard to represent an apple orchard. Add tractors and small baskets children can play with. Fill a large bin with oats. Sprinkle a small amount of cinnamon over the oats. Hide tiny red and green pompoms or tiny apple shapes among the oats. Give each child two cinnamon sticks and let them use them to remove the apples from the manipulation bin, just like chopsticks. Children will love this highly fragrant challenge! Apply a small quantity of paint to an apple and let children spread the paint all over a large piece of paper. Use two paint colors to create a new color (blue + yellow=green). (Open educ-poster-Apples) Print and display on a wall. Give each child an apple model traced on a piece of red construction paper. 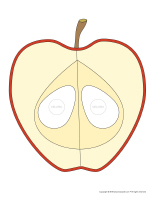 Using white glue, children glue pieces of string (flesh) and apple seeds inside their apple outline. Display their work on a wall, next to the poster. Fill a bin with several different items that are round like an apple. Purchase apple-scented glycerin soaps. You will find them at your local dollar store. Provide small butter knives and forks children can use to sculpt them. 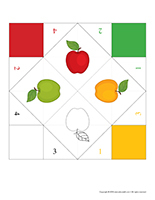 (Open folded paper apple tasting game) Print. Fold where indicated. Slice a red apple, a green apple, and a yellow apple. 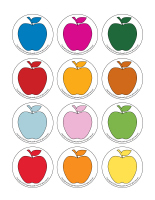 Set each apple on a paper plate of the corresponding color. Manipulate the folded paper game in front of your group. Invite a child to pick a color or number when necessary. If, for example, the folded paper game indicates a yellow apple, encourage children to eat a yellow apple slice. Repeat until all the apples have been eaten. Help children set a small plastic bag in a bowl or drinking glass. The bags must be open. Set a few bowls filled with applesauce on the table and give each child a spoon. Children use the spoon to fill their bag with applesauce. When they are done, seal the bags, removing as much air as you can. Cut one corner of each child’s bag and show them how they can gently squeeze the applesauce into their mouth. With your group, prepare healthy treats. Slice apples after having removed the core. The apple slices should be quite thick, so they look like donuts. Give each child one apple donut. Set squeezable bottles of chocolate and caramel sauce on the table. Show children how they can use them to draw zigzags on their apple donut. Provide sprinkles or ice cream they can add before eating up their “donut”. 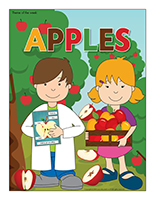 Food item of the week: Apples (Open educ-poster-Apples) Print and laminate. Use the pictures to present the food item to your group. Display the pictures in your kitchen area. Using a juice extractor, make apple juice with your group. Children will enjoy dropping apple pieces in the machine. Experiment with red, green, and yellow apples and observe the differences with your group. Why not make carrot juice, celery juice, beet juice, etc. Encourage children to touch, observe, smell, and taste apples. Show them how you can slice, dice, and grate apples. Do they always taste the same? Ask parents to send an apple to daycare. Use the different types of apples to prepare a special apple salad. (Open my caramelized apple) Print for each child. 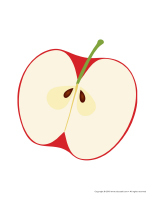 Encourage children to color the apple with a red marker. Next, they can cut it out and glue it on heavy cardboard. 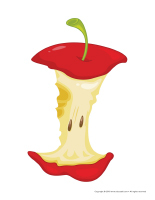 Give each child a Popsicle stick they can stick behind their apple. Once the glue is dry, pour brown poster paint (to represent chocolate sauce) in a bowl. Let children insert the lower portion of the apple in the paint. Before it dries, provide sprinkles children can add to complete their craft. (Open my apple tic-tac-toe) Print the tic-tac-toe grid for each child. If you choose to use the black and white version, have children color it. Ask them to cut out the apple and glue it on heavy cardboard. Each child will need 10 small pebbles that will represent apples. 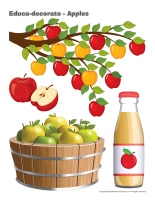 Provide green and red poster paint they can use to paint the apples (5 red, 5 green). Once dry, give each child a small bag they can use to store their grid and apples. They will be proud to take their game home to play with family members. (Open stencils-Apples) Print for each child. Use tissue paper. Tear it into small pieces, crumple them and glue them inside the shapes. (Open apple tree trunk) Print for each child. Purchase a small green shower pouf for each child. Have them glue it on top of their tree trunk to represent leaves. Next, they can glue tiny red pompoms all over it (apples). Display children’s artwork. 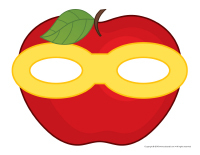 (Open masks-Apples) Print and glue each child’s mask on a stick or elastic so they can easily wear it. 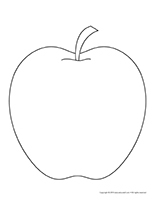 (Open glasses-Apples) Print the model and trace it on heavy cardboard for each child. Cut the inside of each lens out and add red cellophane paper. (Open hat-Apples) Print and cut out. Children can color and decorate their hat. Variation: You could also use a piece of fabric or a circle cut out of red construction paper and simply add a brown construction paper peduncle. Paint each child’s nose and set an apple hat on their head. Photograph each child and print the pictures. Glue each child’s picture in an apple shape cut out of red construction paper. 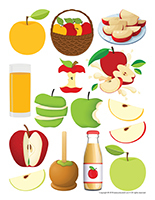 To create a collective poster, cut out a large apple shape and glue the pictures taken of each child on it. Fill a bin with miniature apples and let children manipulate them, trace them on paper, and cut out the shapes. Use the apples to explore colors. (Open models-Apples) Print. Use the models for various projects throughout the theme. (Open puppets-The apple grower) Print on heavy cardboard. Have children cut out the models and decorate them. Stick a Popsicle stick behind the puppets. Cover the bottom of a cardboard box or container (quite big) with white paper. One at a time, ask children to dip an apple in red, green, or yellow paint before depositing it in the box or container. 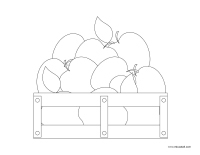 Show them how they can gently lift each corner of the box to roll the apple around to “paint” a picture. Have children paint a paper plate to represent an apple. Cut a stem out of cardboard and glue it on top. Cut a hole out of the centre of the apple. Draw a face on each child’s index finger. 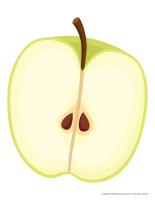 Show them how they can insert their finger through the hole to make it look like a worm is eating the apple. Encourage children to paint apple shapes and glue glitter, apple seeds, jelly worms, or candy pieces on them. When taking a walk with your group, have them collect branches. Use string to tie two branches together to form an “X”. Hang apples from each set of branches to create mobiles you can hang from the ceiling. Variation: Paint small Styrofoam balls to represent apples and hang them from the ceiling. 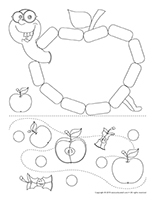 (Open coloring pages theme-Apples) Print for each child. Use white glue to trace the outline of certain parts of a coloring page. Sprinkle sand over the lines and let dry. Shake any excess sand off over a garbage can. 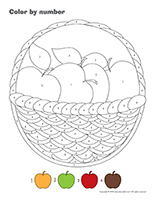 Use the coloring pages to create your own color by number activities for your group. Write a legend at the bottom of the page and write the corresponding numbers in certain sections of the picture (ex. 1=red, 2=blue 3=brown). Cut a coloring page into pieces so that each child has one part of the picture to color. When they are done, assemble the pieces and admire their collective coloring.